I began researching the racist legislation of NSW after accidentally catching on to what NSW governments were doing from 1836 (Vagrancy Act); with successive Parliaments of every political leaning using Legislation to identify and permanently extinguish the human/subject/citizenship rights of the Aboriginal peoples of New South Wales, especially their land possession rights. First I stumbled upon the cleverly concealed and thereby suppressed words of the newly enthroned Queen Victoria in 1839, in an Ordinance which plainly spelled out the British subject status and rights of the Aboriginal Tribes and their Elders. Well it just went from there. As a law student I had discovered Hansards and Select Committee Reports and evidence, and realised what an incredible file of vile attitudes and behaviours towards the NSW Aboriginal nations was concealed in plain view therein. Like Poe’s Purloined Letter, hidden in plain site. And in all those years of government decrees, promulgations and Laws, from the earliest NSW Government Gazette and Historical Records of Australia to SMH Parliamentary Reports to Hansard Votes and Proceedings to Select Committee Reports and Legislation, I scoured to find and photocopy and convert into Word, every single reference to Aboriginal people by NSW Governments since 1788. In all those years 1836 – 2006, from the feeble beginnings of representative government in NSW, only a tiny handful of MPs and MLAs have ever dared to speak up for Aboriginal people, and when they did it was probably at 3.00 am to an empty House and against their own Party’s policies, with dire and vicious attacks on their words, in Debate, Questions etc to follow. Remarkable standouts were MA Davidson MLA, in Parliament 1918-1948, and Col Markam MP in the 1990s. Upon the arrival of British law in New South Wales in 1788, the Aborigines became British subjects and were supposed to have British subject rights. But a series of racist Acts in New South Wales, from the 1836 Vagrancy Act onwards, progressively extinguished these rights, with the aim of keeping the Aborigines politically powerless and landless. The eight Aborigines Protection and Aborigines Acts 1909-1969 were used to systematically identify and suppress every possible Aboriginal subject, civil and legal right, with the purpose of permanently disallowing Aboriginal land ownership. Also extinguished: the right to choose own apprenticeship and spend own earnings as they chose; to control own children; to choose own apprenticeship, living place, or school; to live where they wanted to, and to live within towns; to own their blankets; to freely travel from State to State; to privacy in own home where laws have not been broken; to freely visit and remain with relatives and friends; to control the spending of own wages; to choose own medical treatment; to control own children without unreasonable intervention from others, and to own and control own property. Aborigines Protection Amending Act, 1915. An Act to amend the Aborigines Protection Act, 1909; and for other purposes. Aborigines Protection (Amendment) Act, 1918. An Act to amend the Aborigines Protection Act, 1909, and the Aborigines Protection Amending Act, 1915. The following rights were extinguished by this Act: the right not to be defined or discriminated against on the grounds of race, and the right to choose place of abode. Aborigines Protection (Amendment) Act, (1936). An Act to make further provisions as to the protection and care of aborigines; to amend the Aborigines Protection Act, 1909, and certain other Acts, in certain respects; and for purposes connected therewith. Aborigines Protection (Amendment) Act, 1940. An Act to provide for the dissolution of the Board for the Protection of Aborigines and for the constitution of an Aborigines Welfare Board; to amend the Aborigines Protection Act 1909-1936, in certain respects; and for purposes connected therewith. 4. (1) There shall be a board to be called the “Aborigines Welfare Board” which shall consist of ten members. The following rights were extinguished by this Act: the right not to be “assisted in obtaining employment”; to retain own culture and not to be “assimilated”; not to be interfered with and summarily inspected, to choose own training; not to have your life arbitrarily controlled by the Police; to control, and live with own children; to live with your own family; to choose your own apprenticeship and employer; to choose your own religion; to be paid for your work (slavery had been abolished in all British territories in 1834); to be maintained and have your education and training decided by yourself/ family; to terminate your own unsatisfactory employment and apprenticeship; to communicate with your family, or others whom you choose to have assist you ie lawyers, Aboriginal Members of the Board, political activists (see Vagrancy Act 1836). Aborigines Protection (Amendment) Act, 1943. An Act to provide for the reconstitution of the Aborigines Welfare Board; to constitute the Aborigines Welfare Board a body corporate, and to extend its powers, authorities, duties and functions; for these and other purposes to amend the Aborigines Protection Act, 1909-1940; and for purposes connected therewith. The following rights were extinguished by this Act: Aborigines were appointed to the board, but subject to regime in which they had to have permission to visit Reserves, and could not encourage criticism of board); the right to own property; the right to be Aboriginal with dignity; to be free from arbitrary restriction/ have to have a certificate (“DOG TAG”) (as in South Africa, Nazi Germany), and the right to live with own family. A lot of the Speeches about Aborigines in Hansard, and most though not all (yet) of the NSW Legislation referring specifically to Aborigines can be found on my clunky old-crying out for updating, chronologically ordered list on www.kathystavrou.net: “Caught in the Act, New South Wales Government Acts of Bastardry Against Aboriginal People 1788-2005” by Kathy Stavrou, many scanned as shareable Word documents. It is a work in progress. it’s a source of constant amazement to me, that Australians (all of us black white and brindle) don’t care enough about what our nation has done to its first people, to stand up and do something meaningful against successive governments who have bought these outrages to the Parliament and had them passed without question. I know enough old people to know that people born in the twenties and thirties who are still alive today, didn’t care then and many don’t care now about what we have done to our first people. It doesn’t matter we have done it in the name of “Law and Order”, “protection of aboriginals”, “protection of aboriginal children” or whatever cause happen to have influence on that particular day. We as the invading nation simply do not care. In putting your reflections and the results of your research into words, and making them public Kathy, you identify within yourself, the issues which are important to you but unfortunately were you to make this the subject of a public discussion, the only people to hear it would be those already converted to your view. Rupert Murdoch et al will never allow publication in the mainstream of this sort, because if Australia actually recognised the full rights of our first people, there would be so much uproar generated by the mining companies, the Chinese farmers, simple racists like Pauline Hanson, that you would be shouted down and silenced. Thank you for putting the effort in. 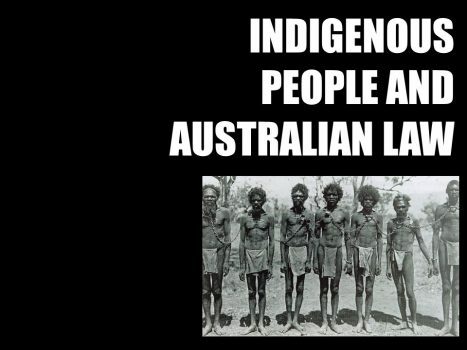 This is typical behavior from a LNP (tory) government they always put the people last, but especially the first Australians because they hate people in general but especially coloured people. The colonial governments found themselves with a problem they didn’t expect: by the will of God Aborigines were destined to die out. They didn’t. If God couldn’t do it, then just maybe, they could achieve it. The cash less wefare card is just another modern extension of the supression of Aboriginal and Torres Strait Islander people in this country. Having read this, and Mr Taylor’s ‘Ordained Genocide’ article, it becomes an inescapable fact that we have progressed from overt destruction to covert destruction of our First People. Their culture. Their knowledge. Their belonging to country. Ms Clausen’s recent article on the cashless welfare card merely underscored how it has become acceptable to administer a non-solution, whereby private company’s benefit, at the cost of those needing assistance. Our First People don’t matter, those looking after them know best. Stan Grant recently posted an article, which represents the conflicting or conflicted interests. The purpose of his dissertation was to celebrate the successes of so many of our First People. In many and varied fields, they are not just coping, but excelling. In the face of much unsaid adversity. I couldn’t help but think that the measure, the yardstick, was our values. The immigrants get to evaluate the occupants, of some 60,000 years, by the immigrants standards. The immigrants values. In the latter part of his dissertation is the following reference. “Academic Marcia Langton has called this out in her Boyer Lectures of 2012. She coined the term “The Quiet Revolution”, but says success comes at a price. “Those of us who are successful run the risk of being subject to abuse, accused of being traitors to our own people, ‘assimilationists’,” she said. It is notable that when our First People succeed, they are subject to suspicion or doubt, from everywhere. We demand they assimilate, by our rules. If they do it too well, we’ll criticize them anyway. Kyran, when they are brainwashed, they are brainwashed. Just try to get sense out of a lot of people on thing Islamic at the mo. The country is awash with headless chooks. Thank you, Kyran. I appreciate that.